Aerojet began operations in 1951. Since that time, Aerojet has manufactured liquid and solid propellants for military and commercial rocket systems and has fabricated, assembled, tested, and rehabilitated rocket engines. In addition, between 1974 and 1979, Cordova Chemical Company, a wholly-owned subsidiary of Aerojet, manufactured paint components, herbicides, and pharmaceutical products. Over the years, Aerojet and Cordova Chemical disposed of hazardous waste by burial, open burning, discharge into unlined ponds, and injection into deep underground wells. Some of these discharges contaminated the groundwater beneath the site with several chemicals of health concern, including volatile organic compounds, perchlorate, and n-nitrosodimethylamine. Over time, the contaminated water reached the location of drinking water wells for private homes as well as the cities of Rancho Cordova, Carmichael, Fair Oaks, and Folsom. 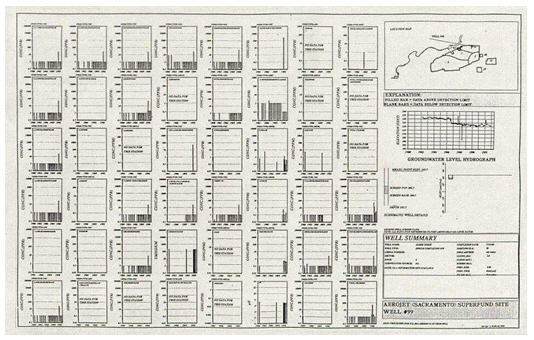 In 1990’s EWM technologies processed one million chemical records monitored in approximately 2,000 wells on the Aerojet site. 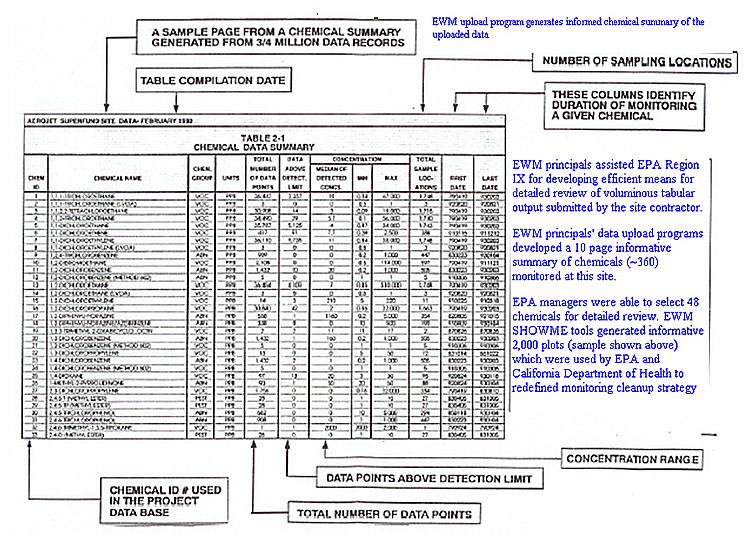 The EPA and the California Department of Toxic Substances Control used EWM Group’s concise informative chemical summary tables and well plots of $80 million dollars worth of data. - Geologic and well details. CFEST groundwater code was used at this site for modeling complex geometry of the geologic setting.